The single FL is a good example of Curtiss innovation - the mixing of major components of two existing models to form a new one. A set of stock Model L wings on the hull and powerplant of' the Model F flying-boat resulted in the entirely logical designation of FL for the single experimental model produced in 1917. It was owned by the American Trans-Oceanic Corp and was advertized for sale in September 1919 at $6,000. Fitting Model L wings to a Model F hull to produce the Model FL is representative of Curtiss's method or developing new models quickly. Two further views of the Curtiss model F.L. 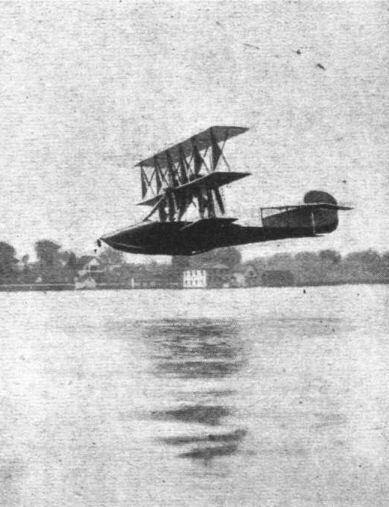 triplane flying boat, which was illustrated in a recent issue of "FLIGHT." The Curtiss triplane flying boat about to "land."